This Coconut Cream Pie recipe is made from scratch and well worth the effort! It’s made with a creamy coconut custard filling and topped with sweetened whipped cream and toasted coconut. We are big coconut lovers around our place! This Coconut Cream Pie is simpler than some but still completely homemade. 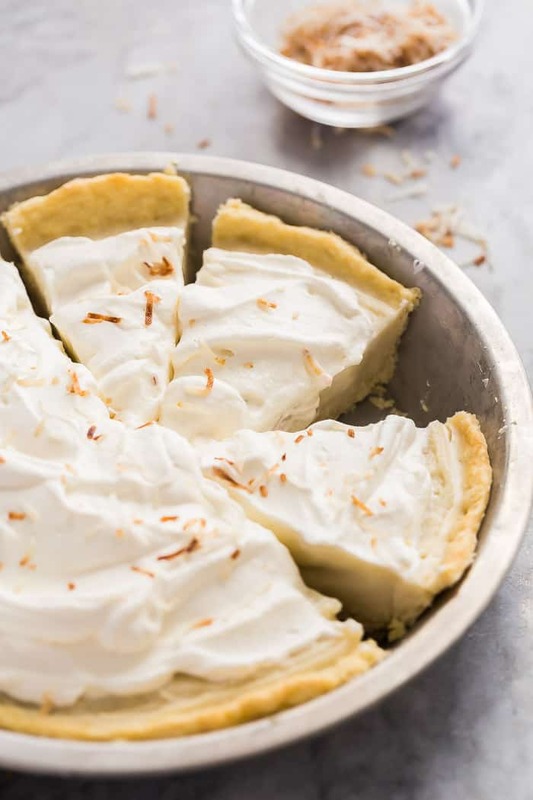 The custard filling is made with coconut milk and coconut extract for big coconut flavor, and it’s poured into a simple homemade pie crust. It’s cool and creamy and perfect for Spring! If you love light and creamy desserts, you might also enjoy this Banoffee Pie Recipe, No-Bake Strawberry and Cream Pie or this No Bake Pistachio Cream Pie. 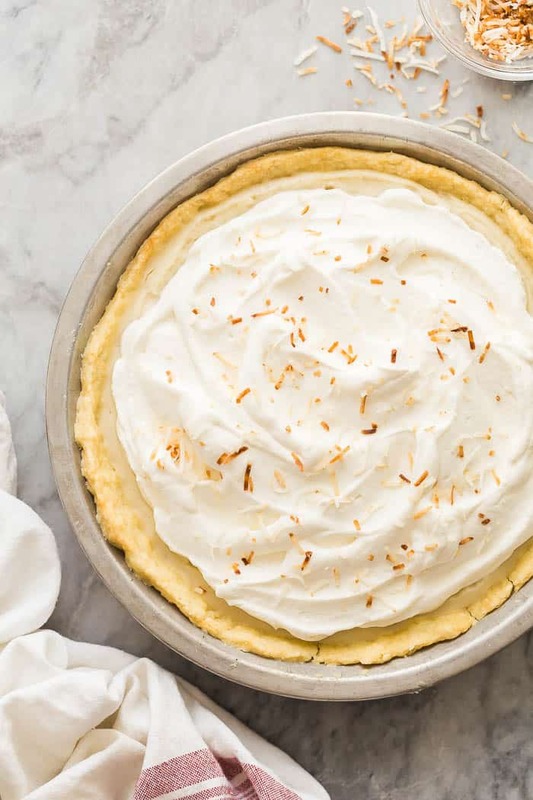 Easter is coming, and if there’s one dessert that has to be on the table, it’s this Coconut Cream Pie! It’s smooth and silky, but made with less hassle than a lot of cream pie recipes because everything is whisked together in one pot before cooking. The coconut custard filling is delicious enough on its own even without the pastry and whipped cream! Start with the crust. This is a simple pastry dough that takes no time to whip together, but feel free to swap out a refrigerate pie crust if you’re in a pinch! Be sure to poke it all over with a fork or blind bake with pie weights so that it doesn’t puff up when baking. Make the coconut filling: I like to take the easy way out, and I haven’t had any one complain about the results! First, we whisk everything together in a medium saucepan, then we cook gently over medium or medium-low heat until it begins to bubble and thicken. If you notice any lumps, you can press through a sieve but I’ve never had anything but perfectly smooth filling! (Just be sure that you whisk continuously while it cooks!). Let cool completely, then top and serve. Because I prefer to skip the shredded coconut in the pie (just my texture preferences — you feel free to add some in if you like! ), I toast some up to sprinkle over the whipped cream so people know what’s inside. Make sure you chill well before slicing! This is a great pie to make the day before serving so it is nice and set when you need to slice. 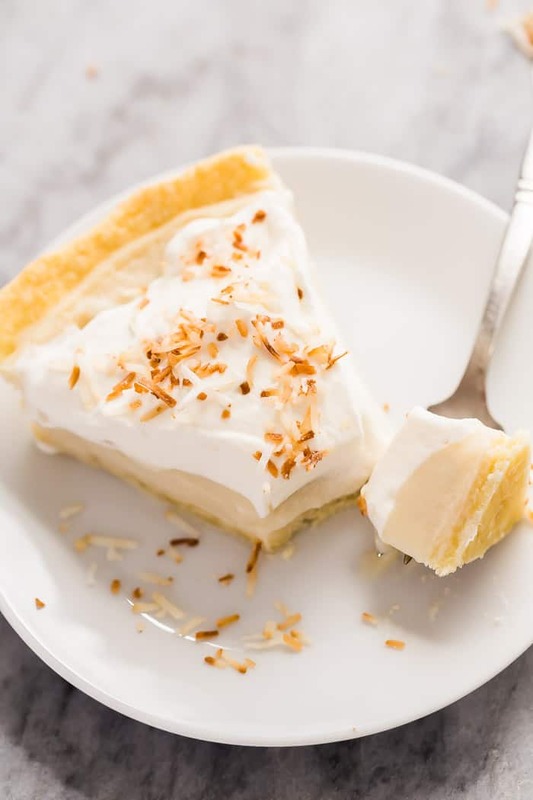 Coconut Cream Pie cannot be frozen or made too far in advance, as custard does not freeze particularly well and will make the pastry soggy if stored for too long. However, this is a great pie to make the day before a special occasion so it has a nice long time to chill. I recommend placing some parchment or wax paper directly on the surface of the custard to chill in the refrigerator, up to 24 hours. Then remove the parchment, top with whipped cream and toasted coconut and serve. Cut in butter with a pastry cutter or fork until you see pea-sized chunks of butter remaining. Gradually add in cold water, stirring each time until you can press it together. Form it into a disk, wrap in plastic wrap and refrigerate for at least 2 hours, or freeze for 30 minutes until chilled. Roll out to fit a 9″ pie plate. Press into the pie plate and up the sides. Try to get as high up the sides as you can as the pie crust may shrink when it bakes. Trim the edges and crimp or leave as desired. Poke the bottom and the sides with a fork all over to help prevent puffing (or use pie weights if you have them). Bake for 10-15 minutes until light golden brown. Set aside to cool while you make the filling. Combine coconut milk, sugar, eggs, and corn starch in a large saucepan. Whisk thoroughly until combined. Cook over medium heat, whisking frequently, until very thick. This can take up to 10 or 15 minutes — be patient! You don’t want to increase the heat too much and risk a lumpy filling. Pour into cooled pie crust and press a piece of parchment paper on to the top. Refrigerate until well chilled, or overnight. Garnish with whipped cream and toasted coconut as desired and serve. *You can absolutely uses regular milk for this recipe and increase the coconut extract to 2 teaspoons.